Fortune Magazine‘s annual list of the 100 Best Companies to Work For is out. It comes as no surprise that among the winners are many organizations from the list of servant leadership companies. What is especially noteworthy is that 5 of the top 10 Best Companies to Work For are also identified as companies practicing servant leadership. That’s right – 50% of the very best companies to work for. Not clear enough? Let me put it another way: if you are one of the top 10 best companies to work for, there is at least a 50% chance you practice servant leadership. Want to have the best employees? Want to improve the quality of your team members? Want to be respected for your treatment of employees? Want to increase the overall creativity, productivity and other critical attributes of your greatest assets? Then you want to make Fortune’s list of the Best Companies to Work For. Want to make that list? 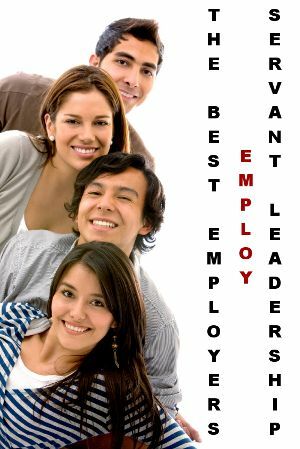 Then you want to make another list as well – the list of companies practicing servant leadership. It turns out, when it comes to being a great company to work and a company practicing servant leadership, size does not matter. Overall, the best companies to work for range in size from approximately 1,000 to 167,000 employees. The servant leadership companies within that list ranged in size from 1,200 to 167,000 employees. While there are no companies on Fortune’s list smaller than 1,000 employees, there is a large variance in the number of employees. As a result, it is clear that size played no part in either making the best companies to work for or the servant leadership companies list. Whether you are big or small you can be among the best companies to work for and you can practice servant leadership. Poor economy also had no impact on the list of great companies to work for or the list of servant leadership companies. The servant leadership companies ranged from -12% to +37% growth in employees, with exactly 1/2 of those companies experiencing negative job growth (employee reduction). Of all the companies on the list, nearly half (45/100) experienced negative job growth. The largest reduction in staff for the year, across all members of Fortune’s list, was in fact -12%. One lesson here is that blaming a poor economy for poor treatment of employees is not an excuse. This reassures those facing a leadership that does not seem to listen. No, you are not crazy, those toxic leaders are just not trying hard enough. After all, if companies that reduced their staff size by 12% overall can still make a list of the best companies to work for, I bet your company could make that list as well. One lesson here is that blaming a poor economy for poor treatment of employees is not an excuse. While only 17 companies were recognized on the list of servant leadership companies, a much larger percentage had employees recognized for practicing servant leadership within them. Specifically, I found 61 of the 100 companies on Fortune’s list had employees recognized online (by themselves, such as in profiles, or by others) as practicing servant leadership. These individuals undoubtedly also have some impact on the results recognized by the study. Regardless of your perspective, it is clear that servant leadership principles benefit organizations. Of course, neither of these lists are the ultimate goal. As you implement servant leadership principles in your organization, you will recognize countless benefits. In fact, you may find that achieving a top 10 position on Fortune’s Best Companies to Work For list is simply a side effect of the great success you achieve. If you ask SAS, Wegmans Food Market, Zappos.com, Nugget Market and Recreational Equipment, I bet they’d agree that servant leadership itself, is a goal worth attaining – regardless of what lists you make. Question: How is your company a great place to work and does servant leadership play a role in that environment? Practicing Servant Leadership..now I know what makes these companies the best and how these companies made it to the top! It’s all about strategy. Ben this is awesome and goes to the rising tide of Servant Leadership. Another majorly important observation is that over time these companies (Fortune 100 Best Companies to Work For) have outperformed the market by over 50%. This may well be the best kept secret of our business generation – servant leadership is the leadership of Superperformance! These companies are smart they put their people first. I will be applying to these wonderful organizations. Thanks for the Info. Thoughts become actions, actions become habits, habits become our character, and our character becomes our destiny.